*This church is just north of the Barberini metro stop. *Relics of St Justin the Martyr rest under the altar within the choir chapel. Kindly ask the sacristan for access. 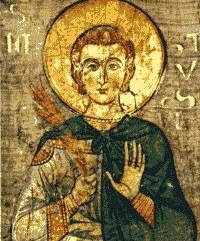 The remains of St Justin the Martyr were temporarily transferred in 1992 to the parish church of San Giustino a Centocelle in Rome; however, they have now been returned to this church. *The bones of nearly 4,000 Capuchin friars are located in the crypt. *This church is located about 10 miles north of Rome. *Some bones of St Justin the Martyr are said to rest in an urn under the main altar. *Note: The parish San Giovanni Battista e Biagio has two churches in the center of Sacrofano. The larger church with a piazza claims to have some small relics of St Blaise. The smaller church, which is located in the historic part of the city and is simply called Chiesa di San Giovanni Battista, has the relics of St Justin the Martyr. *This church is east of the Aurelian Walls. *A marble stone slab beneath the choir floor is said to be the stone on which St Lawrence was placed after his execution. Also enshrined in this lower area is the body of Blessed Pius IX (d. 1878).